Trending at $69.97eBay determines this price through a machine learned model of the product's sale prices within the last 90 days. Miroir Micro Projector Element Series 50" Image HDMI Model# M20. Condition is New. Shipped with USPS First Class Package. Miroir, M20. The Miroir M20 is a truly ultra-portable, weighing in around only 5oz and small enough to easily be transported in bags, purses, and even pockets. Take your projector away from the outlets and directly to your visual sharing space. Miroir Micro Projector M20. DLP 50” Image. DLP image technology. Provides a multitude of shades between black and white for rich color saturation. HDMI input. New Factory Sealed. 2:1 throw ratio range. Equipped with upgraded LED source, the projector is 30% brighter than other ordinary projectors. The 2000:1 dynamic contrast ratio will provide you with a stunningly beautiful images. The pure LED lamp displays natural and rich colors. Used works great. We will work with you to resolve any issues. miroir Micro Projector. Condition is Used. Shipped with USPS First Class Package. Take Anywere and Play movies on any wall or Screen. Item type: Wi-Fi Projector. 1 Wi-Fi Projector. -- 1080P HD picture. LED Lifespan: 20000 hours. Light Source: LED. We provide you with the best product and service. The colors deviation might differ due to different monitor settings. You are looking at a NEW Factory Sealed Miroir Micro Projector Element Series, model M20. Box shows minor shelf wear. Bid with confidence, check our feedback and know that we guarantee customer satisfaction by offering a full refund if you are not happy with your purchase. Box shows white projector, but it actually is Black (see pictures of actual projector, out of box). The Sharpie pen in pictures 2 and 4 are to give you the relative size of the MINI projector. Support orthographic projection, rear projection and hoisting. Wireless projection: Support all kinds of PC, laptop, smart phone, USB, SD card ( not included ). Projection system: LCD panel. Projection distance: 1 - 3m. Opened never removed from box. If its not in the Pictures its not included. COM FOR MORE GREAT DEALS. This is a AAXA Technologies P1 Pico Micro Projector new in the original box. Weighing in at 6 ounces and no larger than most PDAs, the dimunitive P1 is capable of producing excellent image quality and brightness in a wide range of conditions and applications. MIROIR Micro Projector ! Open-Box item, Looks NEW and UNUSED ! WOW ! TESTED ! MIROIR Micro Projector ! Open-Box item, Looks NEW and UNUSED ! Open Box In New Condition. Its physical (native) resolution is up to 320 240 Pixels and maximum resolution is up to 1920 1080. It features compact portable size, easy operation and long using life. Supporting a variety of Video, Pictures and Music formats. 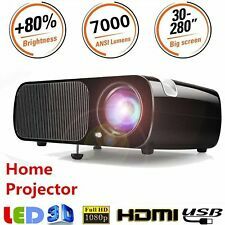 Miroir M20 Micro LED Projector! Brand NEW! Free Shipping. Condition is New. Model Number: PJ608B. Manufacturer Part Number PJ608B. Product Model PJ608B. Manufacturer: GPX(R). Manufacturer GPX(R). DLP(R) display technology. Supports: 480p, 720p, 1080i & 1080p. Includes HDMI(R) cable, micro USB to USB cable & user's guide. EM SALES LLC. EM Sales LLC. Brookstone Pocket Projector Micro. Project images up to 50" diagonal on just about any flat surface. Projects images up to 50" diagonal. Pocket Projector Micro. DEVICE YOU WANT TO CONNECT TO PROJECTOR.